As we're sure you are aware, 2015 has been a busy, and very exciting, year for clean energy. Here at Scaling Green, we've been excited to cover it all, from start to finish. We're also very interested to know what our readers found most intriguing. With that, here are the top 15 Scaling Green blog posts of 2015, based on number of views. Thanks for reading Scaling Green in 2015, and we very much look forward to another great year for clean energy in 2016! New Report by Yale Finds "Nine Types of Americans" on Environmental Issues; Implications for "Green Marketing"
A recent report by Yale University's School of Forestry and Environmental Studies, in association with the Associated Press-NORC Center for Public Affairs Research, examined American public opinion on environmental issues and found "nine types" of people, ranging from "liberal greens" to "homebodies" to "conservative browns" (see graphic below). The findings in this report are fascinating on a number of levels, including with regard to how best clean energy communicators can communicate with people of widely differing perspectives. As the report states, those differences include views on "environmental protection, what the government’s role should be in regulating it, whether an environmental crisis exists, how individuals see themselves in relation to nature, and how individuals respond when scientific and religious explanations conflict." Why Don't Journalists Ask Fossil Fuel CEOs Whether THEIR Industry Can "Stand On Its Own Two Feet" Without Subsidies? Anne Kelly of Ceres: "Businesses...increasingly recognizing that the low-carbon economy is inevitable, and frankly irresistible"
It's fascinating to watch as fossil fuels and clean energy head in opposite directions, the former on a rapid downhill trajectory, while the latter skyrockets. Compare and contrast the following two articles, for instance, from today's Energy Guardian. 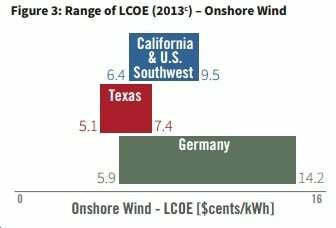 There's a fascinating new study out by researchers at Stanford's Steyer-Taylor Center for Energy Policy and Finance, comparing "the solar PV and onshore wind deployment experiences and policy approaches of California, Texas, and Germany to gain insights into what has worked well – and what hasn’t." There's a great deal of information in the report, but here are the 10 top takeaways based on our reading of it.